It was my first evening at Banyan Tree Double Pool Villas in Phuket and an excitable looking Thai man was beckoning me away from my bubbly. “Miss Jessie, please follow me, I have something to show you…” he said with a glint in his eye. I looked around me, confused, as he beckoned me down towards the lagoon. Hesitantly and somewhat amused, I followed him (clocking the nearest emergency escape routes on the way). “Miss Jessie, I am very excited to have you here,” he continued. “Thank you, nice to be here,” I replied with an undeniable look of concern. A look which deepened when he asked for a lock of my hair. “Or one of your nails if you prefer,” he added chirpily, as if it was a totally normal request. As I took a deep breath and got ready to leg it, he revealed an elaborate gold dish overflowing with delicate bougainvillea blossom. “It is a special Thai welcoming ritual Miss Jessie,” he said as he held his hand out eagerly awaiting my locks. Having decided that yanking out hair was a little more dignified than attempting to gnaw off a nail, I placed my hair amongst the flowers as we lit a candle and the aromatic incense sticks before releasing the display onto the lagoon. “Now make a wish,” he instructed. I closed my eyes and wished that every day could be filled with Thai sun, personal butlers, golden beaches and private pools. 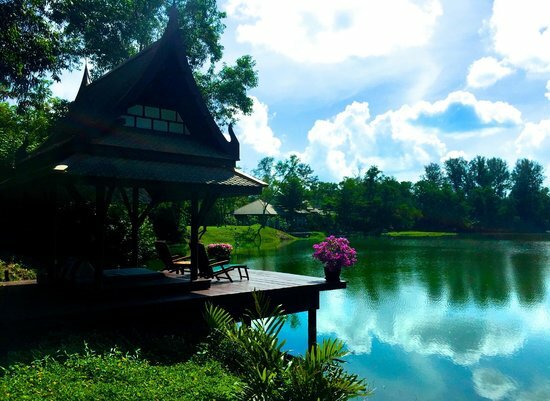 Located in Phuket’s popular Laguna resort, bordering sandy Bang Tao Bay, it’s hard to believe the resort was once an abandoned tin mine. The once arid land, formerly declared unusable, is now a toy town of lush golf courses, lagoons, swimming pools and hotels of varying standards, with Banyan Tree Double Pool Villas leading the way on luxury. Set amidst lush tropical gardens in the quietest part of the resort, each of the exclusive villas comes complete with not one, but two private pool areas and its own Jacuzzi – not to mention a personal butler on hand 24 hours a day. Initially, I was a little taken aback when on arrival my butler, Bou, handed me a mobile phone. After all, holidays are the time when you should lock away the iPad and turn off the phone. Oh, but this wasn’t any old phone: “If you need anything just dial 1 and you can reach me day or night,” he urged. Bou rustled me up a feast in the kitchen and served me a delicious poolside breakfast after which I embarked on an exhausting morning reading my book and bubbling away in my Jacuzzi overlooking the lagoon whilst absorbing the Thai rays. Naturally this was incredibly tiring so Bou magically conjured up the legend that is Khun Koe Pi, aka ‘The Coffee Man’. Every day the traditionally dressed coffee man visits the exclusive villas with his elaborately presented coffee and freshly made cakes. The brew certainly has a sting in its tail, one which is tamed once mixed with sweet cream. Once the caffeine kicked in, I jumped on my villa bicycle and explored the resort. Winding my way through the golf course and tropical gardens, I eventually peddled my way to the beach. Its picture postcard sandy shores are busy with tourists enjoying the shallow waters during the day, but as the sun set, I had the beach to myself. Lined with Thai restaurants and cafes, it is a good place to grab a pad thai and watch the krathongs (lanterns) float into the distance. Feeling suitably tipsy after a cocktail or two, I jumped back on my bike and wobbled my way back to the villa to retreat to my floating bedroom (no this is not the drink talking, it really is surrounded by another private pool, complete with a submerged dining table and chairs for romantic candlelit dinners). The next morning I awoke to find Bou waiting for me with freshly brewed coffee and a platter of exotic fruits to die for. Having shaken myself out of my cocktail induced coma, I headed off towards the spa. With an emphasis on holistic healing as opposed to hi-tech medical treatments, the whole look and feel of the spa is designed to relax you the moment you enter and the Thai treatment pavilions are no exception. Re-creations of royal Thai salas, their walls are adorned with stone sculptures and meditating Buddhas. A tranquil lily pond teeming with freshwater fish surrounds the relaxation courtyard. After an hour of being pummelled and pampered, it was back to my villa for a private poolside lunch. True spa-a-holics can stay in the hotel’s ‘Spa Sanctuary’; a selection of villas with treatments on demand. Here spa junkies have an all-inclusive treatment account allowing them to indulge in as many manicures and massages as they can handle! As the sun set on my last evening, the doorbell rang one last time; it was Bou with an enormous Thai lantern. As we stood under the moonlight in my garden, reminiscing on my stay, he lit the fragile krathong and yet again uttered his favourite words: “Miss Jessie, make a wish”. I smiled contentedly, absorbing the moment; my own pool, butler and chef. What do you think I wished for? I wished it would never end. Oh, but how the mighty fall…Just 24 hours later I landed at Heathrow in the middle of a snow storm. Having begged a taxi man to collect me, I collapsed in the pungent car. Banyan Tree’s burning incense was quickly replaced by the taxi’s stagnant air freshener swinging from the mirror. As jetlag struck, the fear of forgetfulness crept over me. As soon as I plunged my hand into my luggage, I knew. Searching turned to rummaging which mixed with panic turned into an explosion of dirty laundry and sun cream and a very scared looking taxi driver. No keys. I was locked out. As he kicked me out of the cab, I stood on my high street, knee deep in snow wearing only a sundress, flip-flops and a frown. Having checked in to the local pub, I surveyed my surroundings; ripped sheets, broken light bulbs and only a spider for company. If only I could ‘just dial 1’. Prices start from £800 per night in Banyan Tree Phuket Double Pool Villas, based on two people sharing, including breakfast and all taxes and charges. For more information about Banyan Tree Hotels and Resorts, visit the website.